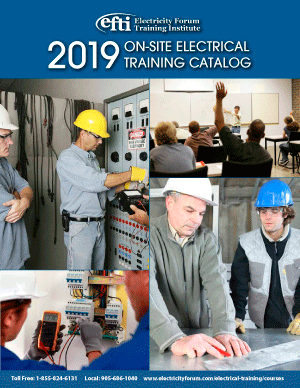 Since 1986, The Electricity Forum Training Institute has trained more than 50,000 electrical professionals from Industrial, Commercial and Institutional sectors on a wide range of electrical technical subjects. Our instructors are qualified, certified, electrical industry experts with many years of practical knowledge based on both field experience and education. Our electrical on site electrical training courses can be tailored to meet your company’s specific requirements that meets your own training standards. Our instructors will work with you in advance to determine the level of electrical experience of your employees to best design training that meets the specific applications that you would like covered. Time spent examining and observing your actual equipment will add relevance and meaning to the course outcomes. You set the schedule to best suit your company’s shift and employee work schedule. It is common to divide on-site electrical training courses into two separate modules, allowing employees to attend at different times. This allows your company to best manage the workloads and account for normal work activity. Evening and weekend training can be arranged. On-site electrical training courses are effective because they are delivered using the equipment your electrical technicians use every day. This maximizes the educational value of your electrical training investment.